RevisePad The best e-magazine portal online. Daily updates on news, technology, health, finance, sports, trending videos & many more..
An Italian passenger ferry caught fire off Corfu a Greece coast on the way to Ancona at 7.56am local time. Vessels and choppers were sent to site for rescue operations. Estimated nearly 500 passengers were on board when the incident happened. According to sources, the strong winds, rough seas and poor visibility delayed rescue operations. People were rescued immediately due to the immense amount of vessels nearby the incident. Passengers from Turkey, Albania, Italy, Germany, Switzerland, Belgium and France were on board. The crew is Greek and Italian. 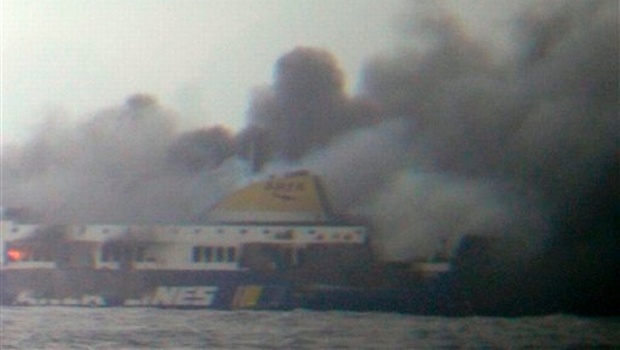 The ferry started burning by sinking rapidly. Greek coast guards have rescued more than 170 people on rescue boats. Rescue efforts are progressing it its way. Sources say that, fire broke out from the car deck on the ferry with 425 passengers and 59 crew members on board. Italian and Greek defense forces were in the rescue mission of the Italian Ferry. Nearby 10 merchant ships also helped in the rescue mission where they have formed a barrier in order to reduce the sea currents directly to the ferry. Those who were rescued were taken to the hospital treating hypothermia due to the cold weather conditions. Previous: Bangalore Horrified in grips of terror. Blast in church street. 1killed 2 injured. © 2019 RevisePad.com, All rights reserved.